OpenVPN is free and open-source software that provides Virtual Private Network (VPN) connectivity that is available for a variety of operating systems. To use the software on a Microsoft Windows 10 system, download the the installer for Windows Vista and later from the OpenVPN Community Downloads page; get the OpenVPN community software not the PrivateTunnel software from the OpenVPN project - I mistakenly downloaded and installed PrivateTunnel when I first went to the OpenVPN site and then had to uninstall PrivateTunnel. 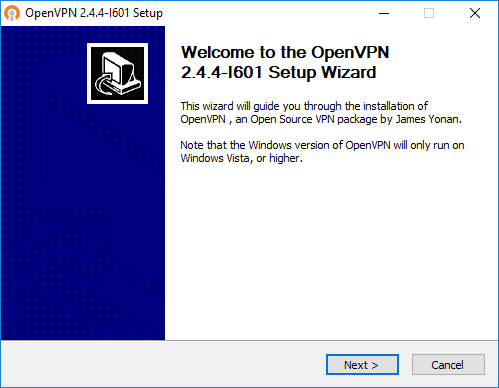 When you start the installation of the OpenVPN software, you will see the Welcome screen. 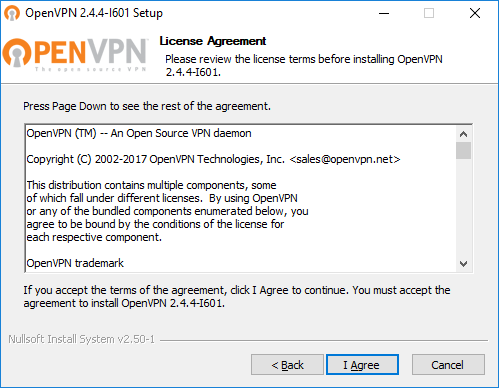 The next screen will present the OpenVPN License Agreement. At the next screen you can choose, if you wish, to include additional components, or accept just the default ones. You can also check the check box next to "Disable Password Save Feature in OpenVPN", but that option isn't checked by default. I left it unchecked and also unchecked "Launch OpenVPN GUI on User Logon", since I wanted to start the software manually when I needed to use it rather than have the program start automatically. You will then be prompted to specify the directory where the software will be installed; the default location is C:\Program Files\OpenVPN. As of version 2.4.4, about 12 MB of disk space is needed for the software installation. 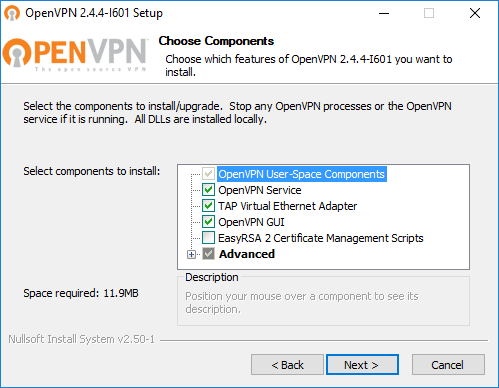 OpenVPN requires a configuration file and key/certificate files. You should obtain these and save them to OpenVPN's configuration directory, usually C:\Program Files\OpenVPN\config. 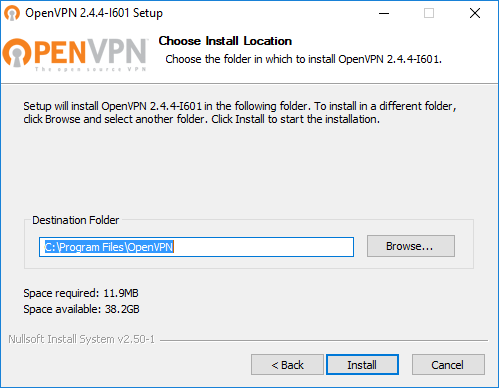 Starting with OpenVPN 2.4-alpha1 you can also put user-specific configurations to %USERPROFILE%\OpenVPN\config when using OpenVPN GUI. 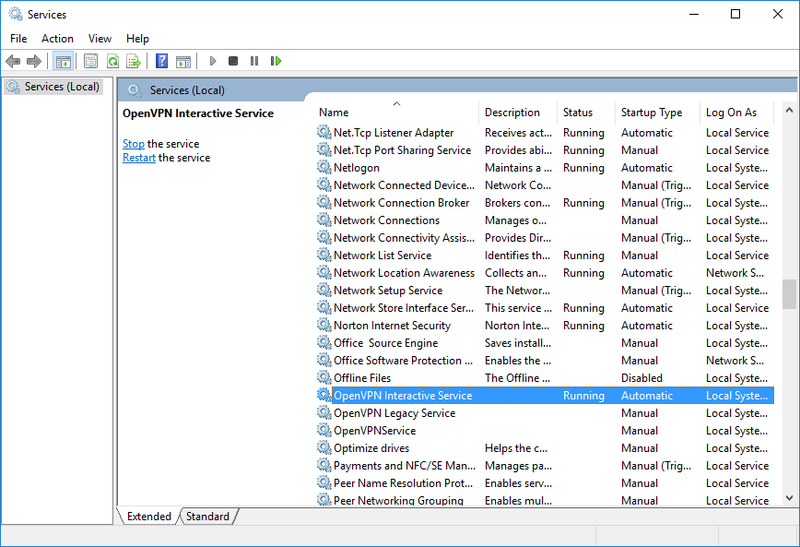 If you type services.msc and hit Enter in the Cortana "Type here to search" field next to the Windows Start button, you should see OpenVPN services listed with OpenVPN Interactive Service listed with a status of "Running." You should also see it listed if you run the net start command at a command prompt. C:\Users\Administrator>net start | find /i "OpenVPN"
No readable connection profiles (config files) found. Use the "Import File.." menu or copy your config files to "C:\Users\JDoe\OpenVPN\config" or "C:\Program Files\Network\OpenVPN\config". If you wish to use the software with a commercial VPN service, that service may provide configuration files you can download. E.g. 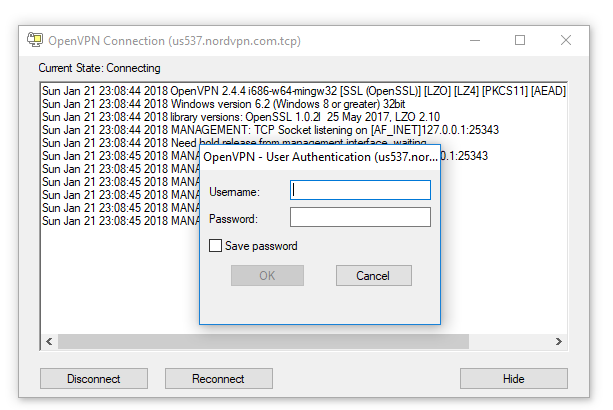 NordVPN provides configuration files at https://downloads.nordcdn.com/configs/archives/servers/ovpn.zip. For NordVPN, if you extract the files within the Zip archive, you will see a ovpn_tcp and ovpn_udp subdirectory. 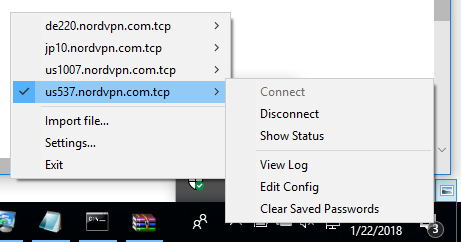 You can select configuration files from within those directories depending on whether you wish to use the Transmission Control Protocol (TCP) or User Datagram Protocol (UDP) for OpenVPN connectivity to the NordVPN servers. The configuration files have two letters at the beginning of the file name that represent the country code for the country where that server is located, e.g., us1107.nordvpn.com.tcp.ovpn is a server in the United States. Since the OpenVPN GUI application doesn't support more than 50 configuration files in the /config/ directory, don't place more than that number of configuration files in that folder. Each file represents a server. Once the installation is complete and you've placed configuration files in the config directory, you can easily switch between the servers you have copied over within the OpenVPN GUI application. 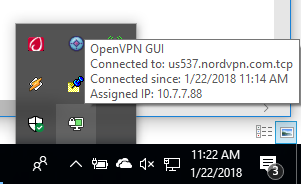 You can run the OpenVPN application and select it from the system tray - you'll see an icon of a monitor with a padlock icon on it representing the OpenVPN application. If you right-click on that icon, you will see a list of the servers whose configuration files you placed in a config directory. When you select one of the available servers, you will have then have the option to select Connect to establish a VPN connection using that server. You will then see a login prompt; you can choose to save the username and password, if you don't want to see the prompt for subsequent connections. 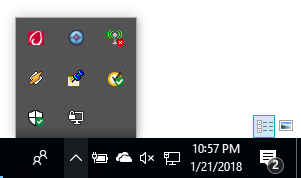 After you've connected, if you place the mouse pointer over the OpenVPN icon in the notification area, you will see the icon has a green background for the monitor displayed in the icon and you will see information on the server to which you connected. 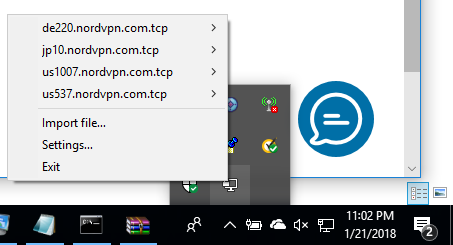 If you right-click on the OpenVPN icon and select the server to which you are currently connected, which will have a checkmark next to it, you can choose Disconnect to terminate the VPN connection.